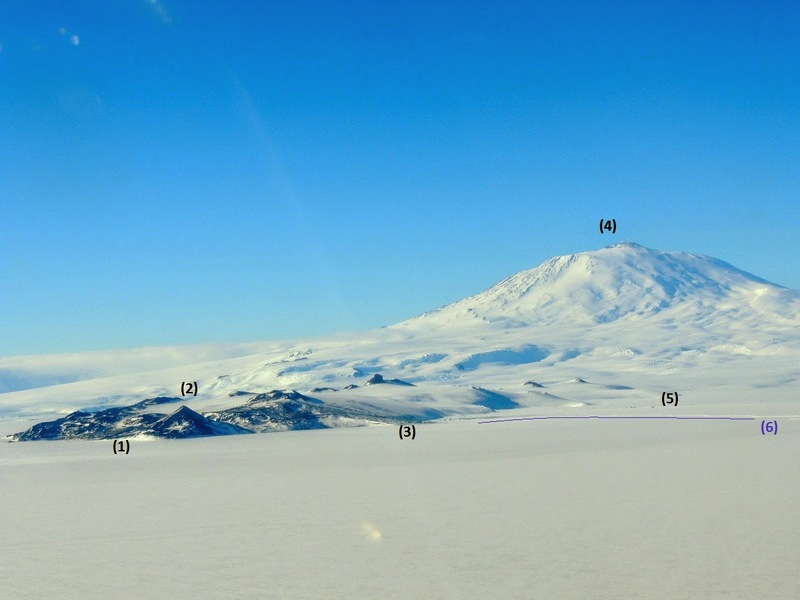 Sitting just to the east of McMurdo Station is Observation Hill, known locally as "Ob Hill". It is 230m (750ft) high and provides a nice hike when the weather is good. Scott Base, which is the New Zealand research base, is just on the other side of the hill. The lay of the land surrounding McMurdo. I took this picture from a helicopter. The edge of the Ross Ice Shelf (RIS). The blue line marks the transition between the sea ice and the ice shelf. The sea ice can melt out each season and is the result of sea water freezing. As I posted before, the RIS is floating ice that has come from the glaciers on land. 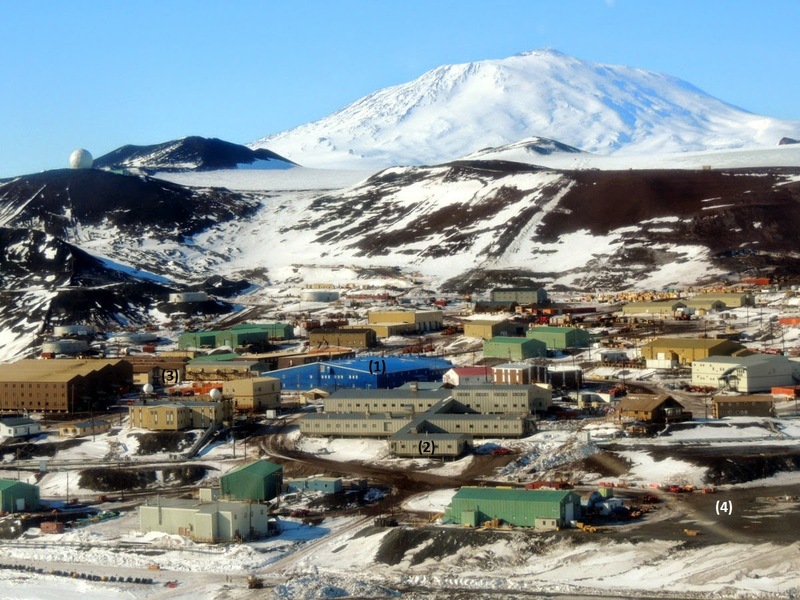 McMurdo seen from a helicopter. Mt Erebus sits behind us, but it cannot be seen when in town. Myself (in red) and Atsu Muto (in black) on the summit of Ob Hill. Atsu did his graduate studies at the National Snow and Ice Data Center (University of Colorado), which is where I work. He studied the recent (50-year) temperature history of the East Antarctic Plateau and is now at Penn-State University working on detecting changes in ice mass via gravity. It was great to see an old friend in MacTown. The cross in the photo above was erected in 1912 in memory of Robert Falcon Scott's party that attempted to reach the South Pole and return. The party perished on the Ross Ice Shelf after reaching the Pole. While on the summit we heard someone playing a saxophone - it was Jon Reese (a seal biologist) who carried up his instrument to play while taking in the view of Mt Erebus.